Former KGB spy Alexander Litvinenko was working for the British secret service when he was poisoned in November 2006, a legal review has heard. The court was told that Mr Litvinenko was paid by MI6 and was working alongside Spanish spies in the days before his death. British government documents which implied that Russia was behind the 43-year old's murder were also revealed. Moscow has previously denied any involvement in Mr Litvinenko's death. The pre-inquest review, presided over by a judge sitting as coroner, looked into the scope of the inquest which is due to begin on 1 May 2013. Mr Litvinenko died in November 2006 after ingesting polonium-210, allegedly during a meeting with ex-KGB contacts Andrei Lugovoi and Dmitry Kovtun. Russia has refused to extradite main suspect, Mr Lugovoi to the UK for questioning. First, that the British government had provided information pointing to the role of the Russian state in the killing. Individuals have been accused before but not the state - at least openly. Secondly, came details that Mr Litvinenko had been a paid agent of MI6. On one level this was not surprising and had long been rumoured. But the detail was hugely significant. He met his MI6 handler just before he died and MI6 had put him in touch with Spanish authorities. He was due to go to Spain with the man accused of murdering him. This involvement, the lawyer for his widow said, meant the British state should have protected him. A key question has now emerged - was Mr Litvinenko killed by the Russian Secret Service and was he killed because of his relationship with the British secret service? Ben Emmerson, the lawyer representing Mr Litvinenko's widow Marina, told the hearing at Camden Town Hall, London that the inquest should consider whether MI6 failed in its duty to protect against a "real and immediate risk to life". Mr Litvinenko was thought to have worked for MI6 for several years and was working with the Spanish secret service investigating the Russian mafia shortly before his death. Payments were made by both the British and Spanish secret services to a joint bank account Mr Litvinenko held with his wife. Mr Emmerson said the Russian had a dedicated MI6 handler, known as Martin, whom he met on 31 October 2006 just days before he was poisoned with the radioactive polonium-210 isotope at the Millennium Hotel in central London. He added that MI6 and the British government had an "enhanced duty" to ensure the Russian's safety when tasking him with "dangerous operations involving foreign agents". Mr Emmerson also revealed that Mr Litvinenko was due to go Spain with Mr Lugovoi as part of his work to help Spanish prosecutors understand the role of the Russian mafia. Neil Garnham, representing the Home Office, told the review he could "neither confirm nor deny" whether Mr Litvinenko was employed by British intelligence. During the submissions, the counsel to the inquest Hugh Davies revealed that documents from the British government show that Russian state involvement in Mr Litvinenko's death was evident. Mr Davies said assessments of the confidential government material "established a prima facie case as to the culpability of the Russian state in the death of Alexander Litvinenko". 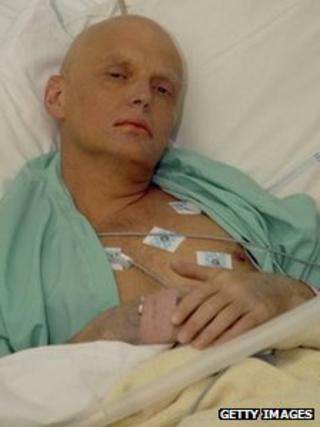 But he added the documents showed no evidence to suggest Britain was involved in the poisoning of Mr Litvinenko, or that it failed to take necessary steps to protect him. The evidence also ruled out the involvement of other parties, including the former spy's friend Boris Berezovsky, Chechen-related groups and the Spanish mafia, Mr Davies said. The Kremlin has indicated it would like to become an interested party in the inquest, which would allow representatives of the state to cross-examine witnesses and examine evidence. It will begin next year before High Court judge Sir Robert Owen.